YouTube stars have become celebrities to young audience and the content produced by these stars are consumed by our kids and have a powerful hold over them. Recently, a 7-year-old YouTube star named Ryan became a toy tycoon after catching the attention of the world’s largest retailer Walmart earlier this year. His namesake toy line “Ryan’s World” is one of the season’s biggest sellers, according to Brad Bedwell, a senior buyer in toys for Walmart. "[My nephew] exclaimed ‘Combo Panda!’ And I was like, I can’t believe he recognizes this character. This is a character that’s on Ryan’s YouTube channel and nowhere else. And he recognized it at the drop of a hat”, exclaimed Bedwell. YouTube celebrities are very influential in shaping trends, guiding pop culture and impacting opinions. According to Common Sense Media, it's smart to have some awareness of your kids' media idols because plenty are not age-appropriate. For example, the Swedish gamer PewDiePie was discovered to have created racists and anti-Semitic videos (which caused YouTube to cancel a reality show he was set to star in). A lot of YouTubers take advantage of the platform's freewheeling nature to swear and make sexist, homophobic, and other offensive remarks. It's completely age-appropriate for kids to become devoted to certain media figures. But you want to help your kids find positive role models and being aware that, to your kids, these YouTubers have something meaningful to offer is step one. Stay involved by watching together when you can. Ask questions about the hosts your kids like, what subjects they cover, and most important, what these topics mean to your kids. 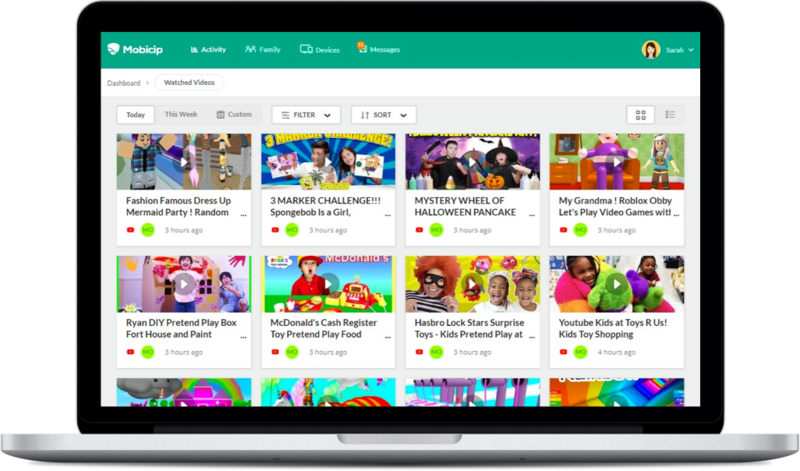 With Mobicip Parental Control's rich reporting feature, keep an eye on the YouTube videos watched both in the app or through a browser to have a meaningful conversation with kids and to get your ideas across.